Let’s be honest, when most of us think about Mississippi, we don’t immediately think ‘Hey, that sounds like a good cycling destination.’ Truth or not, perception is powerful – which is why we jumped at the chance to consult with the town of Ridgeland, one of only two Bicycle-Friendly Communities in all of Mississippi. We first met Mina at last year’s National Bicycle Tourism Conference. We were so surprised and impressed to see a small-town tourism professional from Mississippi that we couldn’t not find out all about Ridgeland and why they were thinking about bike tourism. It turns out that the Mayor of Ridgeland, Gene McGee, is an avid cyclist. We’ve seen our fair share of politicians who dig out their dusty bikes whenever the press cameras show up – but this is not Mayor McGee, who hits the pavement for his daily rides whether or not anyone’s watching. The joke, we were told, is that any new ideas for the city had better include bikes. Ridgeland is also conveniently located along the Natchez Trace, which is one of those great bucket list routes. 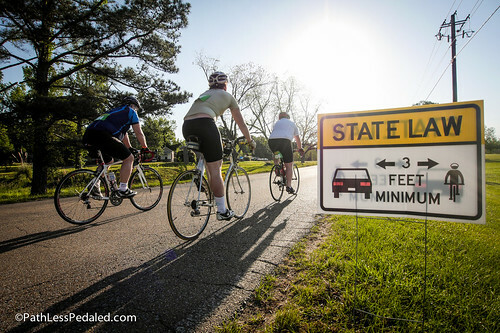 Every year, Ridgeland sees hundreds of people ride by without stopping, pedaling as fast as possible because there’s too much traffic and everyone says to just get out of Dodge. If only those touring cyclists knew about the nearly-parallel, off-road, multi-use path that local cyclists credit with an increasing interest in biking. In short, Ridgeland has all the makings of a perfect bike tourism storm. So we flew out for a whirlwind weekend in early May – and came back excited to see what they create. The anchor for the weekend was the Natchez Trace Century Ride. The good folks at Indian Cycles set us up on a pair of zippy road bikes, and we rode a portion of the century route. 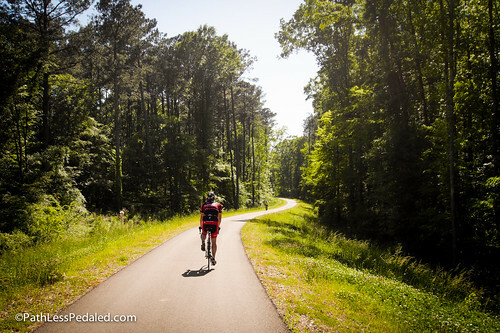 The ride may be named for the Trace, but the majority of the ride ventures away from the parkway, following small country roads through equally small towns and beside the Ross Barnett Reservoir (populated, we hear, with its fair share of gators). Four years ago, we crossed the Mississippi River into Vicksburg, pedaled into the Jackson area, and rode the Natchez Trace into Nashville. We may have spent two weeks in Mississippi, but most of it was either in urban Jackson or along the Trace. The century ride gave us the opportunity to ride into the country and really experience the area. The century ride also gave us the opportunity to enjoy the tree-lined streets and wave at the kids who were watching the riders go by – with the help and support of dozens of volunteers running rest stops and local police stopping traffic at busy intersections. Beyond a shadow of a doubt, though, the best part of the century ride was the hospitality. 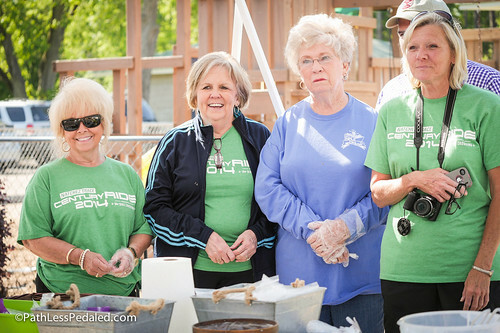 The century ride treats all riders to a kick-off party the night before the ride, lunch after the ride, and a catered event that evening. This is not a ‘come, ride, get out’ sort of event, this is an invitation to linger and learn more. Oh, and there were the delightful women in Pelahatchie who could hardly believe that we don’t say “y’all” on the West Coast. The rest of our weekend in Ridgeland was spent exploring possible day ride routes, touring the mountain bike park, riding the multi-use trail with the Mayor, talking with local cyclists, brainstorming new ideas, presenting about bike tourism, and eating way too much good food. Granted, we also heard from folks who ride at 4am to avoid the traffic, or who always go out in a big group because ‘you never know what can happen’ – so there is still a lot of work to do. 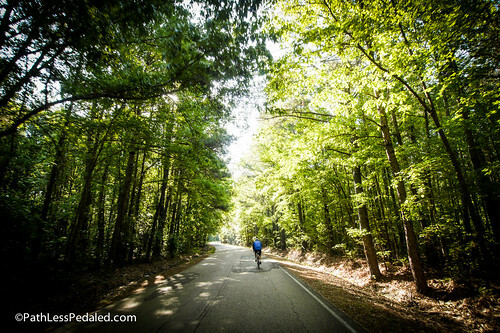 But, bicycling is on the rise in Ridgeland, and there’s a lot of genuine interest in embracing cycling as both a quality of life benefit and a tourism asset – and that’s where good things start. Four years ago, when we rode through the South, we never thought these places would prick up their ears to the benefits of bicycling – and, yet, that’s exactly what’s starting to happen. One of the things that we tell small towns is that bike tourism allows them to embrace who they are, rather than needing to become “like Portland.” In the South, this makes even more sense, because just being “the South” is enough of an intrigue for those of us who don’t live there. Don’t believe me? Just imagine how good fried chicken and boiled shrimp will taste after a long bike ride. After a great weekend in Ridgeland, seeing first-hand the growing momentum around bikes, we’re excited to see what they create, and how they help lead the rest of the South. Come on come on, throw out the name of the other Bicycle-Friendly Community in Mississippi…. Ridgeland is the quintessential white-flight city. It’s citizens work in Jackson, then live across the county line, so they don’t have to look at black people after they get off work. Ridgeland, like most white flight cities, was hastily planned and developed which means horrific traffic and an almost complete lack of complete streets policy. Sure, there’s the Trace, which is more popular for motorcycles than bikes, but you can’t actually ride to the trace safely on a bike. You have to load up your bike on a car first…which kinda defeats the point of cycling, no? And riding down winding country roads in Mississippi on a bike?? I guess that’s as good as any place to die. Maybe the area has changed in the 8 years or so since I lived there, but this isn’t an area of the country that embraces change or progressive ideas, so I seriously doubt it. Kudos to the Bike Tourism folks for daring to visit the worst state in the country in search of bicycle friendly places, but I think you’re doing your followers a disservice when you advocate visiting Ridgeland instead of the myriad other places which are way better to ride. We absolutely agree that there’s a lot of work that needs to be done in Ridgeland, and across Mississippi. In our wrap-up with the city, we talked about the importance of building an improved network of safe routes that allow people on bikes to ride to the trail system or to the Trace or other destinations. And we pointed out that it’s crucial for the city and tourism folks to work with bike advocates. But writing off the city doesn’t do anybody any good. Change is slow; and for it to stick properly, it must be supported. Part of the reason that we support bike tourism is that it enables many more people than just die-hard bike advocates to come to the table and talk about improving their city. In a place like Mississippi, talking about the benefits of biking to work may not be a successful argument; but talking about how building bike lanes can bring in tourist dollars can resonate with the business owners and city officials who need to be on board. Wow! Deem! I am sorry someone tee-teed in your cereal this morning. I am guessing you would not believe your own eyes concerning how much progress has happened towards bike friendly cycling in the 8 years you have been away from Mississippi. The Metro area has at least 30 miles of multi use trail, beginners rides virtually every night of the week, a women’s only bike ride once a month and so many organized bike rides a cyclist has to choose which rides they can participate in each week. Mississippi is #31 on The League of American Cyclists bike friendly states list which is far from “the worst state in the country” to ride a bike. I will also mention that it is extremely easy to ride a bike to the Trace and on the Trace and all over the country roads and many of the urban roads in Mississippi – no car necessary. We have the same problems that every state has concerning drivers and cyclists which in my opinion is more about distracted driving than anti-cycling. Mississippi has a long way to go to become a top 10 cycling friendly state and Ridgeland has a long way to go to become platinum bike friendly city, but even Boulder Colorado has cyclists that own bike racks for their cars. Please consider coming down for a visit to see for yourself that Mississippi has embraced change and progressive ideas. I would be glad to take you out for a nice calming bike ride! Thanks all for the dialogue and discussion, which is an important part of growth and change. But I don’t think we should jump on anyone for their comments, because we all recognize that there is still a lot of work to be done. 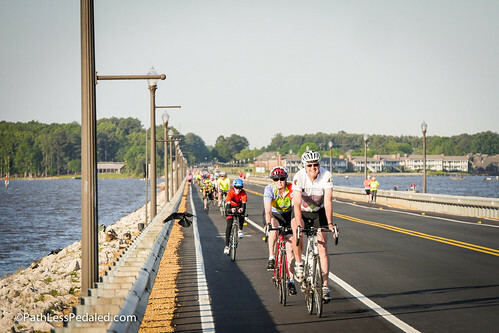 Our hope, with our visit to Ridgeland and this post, is to shed light on the changes that are taking place in some of the least-expected locations, because its places like Ridgeland that can help broaden the support for bicycling across the country. Here’s a link to what “deem” doesn’t know about bicycling in Ridgeland. After 8 years, you should come back and see the biking community for yourself before you spread you obvious anger for the City of Ridgeland. I live in Jackson. I appreciate Gene Mcgee’s efforts on Ridgeland, and we on Jackson are reaping some of those benefits. Give progress a chance. We have been on all OBO Tandem Rallys in Ridgeland, and you cannot be farther from the truth. Ridgeland and the people who live there are Great. We have the end of March blocked out for the foreseeable future and wouldn’t miss the chance to get to Ridgeland. You may want to visit more often than 8 years. By the way we have met many local black friends. I spent two months in Mississippi this year, primarily in the Gulf Coast region, and it’s really a mixed bag. On the one hand, there were the terrifying, no-shoulder roads with pickup trucks barreling down them and the “bike paths” that were glorified crumbling sidewalks, but on the other hand, there were also signs of initiative in cycling infrastructure: low-traffic bike routes, sharrows and signage on major interstates, bike racks on city buses, etc. There are definitely improvements being made, but true to Southern way of life, they are taking their time. I am a resident of Ridgeland and avid cyclist. I take offense at the above comment, since I didn’t move here so I ‘wouldn’t have to look at black people.’ And Ridgeland goes back to the 1800’s, and hardly a ‘hastily planned white flight’ city. Named one of the top 100 towns to live in by Money magazine in 2007 and 2011, I suggest anyone visit and judge for themselves. One spectacular ride is 40 minutes away at the Vicksburg Mem. Park, with the closest thing we have to steep climbs, along the Mississippi River, amid pristinely kept battlefields. Thanks for the tour overview, R&L. I’m planning a ride down the Mississippi later this year, from Ohio to NOLA and am very interested in riding impressions and tips. (there is precious little info out in the blogosphere.) I’m glad to hear that communities are picking up on the benefits of simply supporting safe accommodation for cyclists! We don’t ask for too much, we’re happy spending money on room & board, and we enjoy meeting local folk. Looking forward to riding on the Trace.